A Greenpeace undercover operation has shown 23,000 tonnes of computers are being illegally exported to Africa every year. When added to other forms of toxic e-waste, up to 500,000 tonnes of tech waste could be being dumped in countries like Nigeria every year. 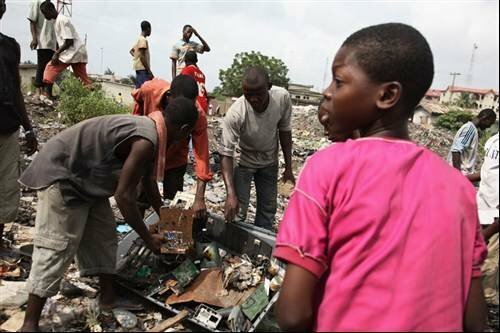 Greenpeace has found the UK’s tech waste is being dumped in developing countries instead of being recycled. Around 500,000 tonnes of tech waste in the UK are unaccounted for every year. By using GPS technology to track a TV intended for recycling, the charity has shown how waste from the UK is poisoning countries like Nigeria. "Companies can stop this illegal toxic trade now by ensuring their goods are free from hazardous components. It is critical they take full responsibility for the safe recycling of their products and put an end to the growing e-waste dumps that are poisoning people and the environment across the developing world," said Martin Hojsík Greenpeace International Toxics Campaigner. Some will be repaired and reused, but many are beyond repair meaning they will eventually be dumped in countries where no facilities exist for safe recycling. Europe, the United States, Japan and South Korea are using developing countries, including Nigeria, Ghana, Pakistan, India and China, as toxic e-waste dumping grounds.